This fall A2J will be hosting its annual organizing conference in Ottawa, Ontario to strategize on ways to reverse the trend of exponentially rising law school tuition that currently far exceeds the financial means of many students. We are aiming to bring together law students, law professors, legal professionals, and community members from across Ontario to share experiences and to discuss ways to target law faculties, the province, and the Law Society of Upper Canada to: (1) decrease law school tuition and (2) to foster the practice of law that relates to issues of social justice and for vulnerable and low income clients. What is all this talk about access to justice? 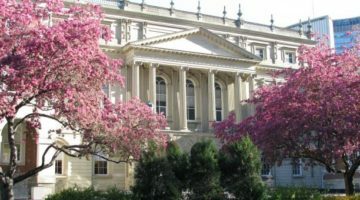 The legal profession in Ontario is in crisis – it has been for years. Within the neoliberal economic model of doing more with less, law students are being saddled with more debt with the discouraging prospect of fewer articling positions, fewer jobs and no immediate prospect of doing work in areas serving low income clients, sole practice and areas of social justice. While the profession lauds the high values of pro bono and volunteer work, new lawyers and students are faced with the choice of securing employment versus working in areas of social interest or relevance to them. Law schools, the Law Society and legal practitioners are inextricably involved in reinforcing the existing structures of training and practice that serve to reproduce and aggravate the current model of debt servitude law. 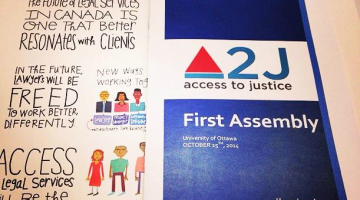 You’re invited to the Second Annual A2J Assembly at the University of Ottawa on Saturday, October 24, 2015. 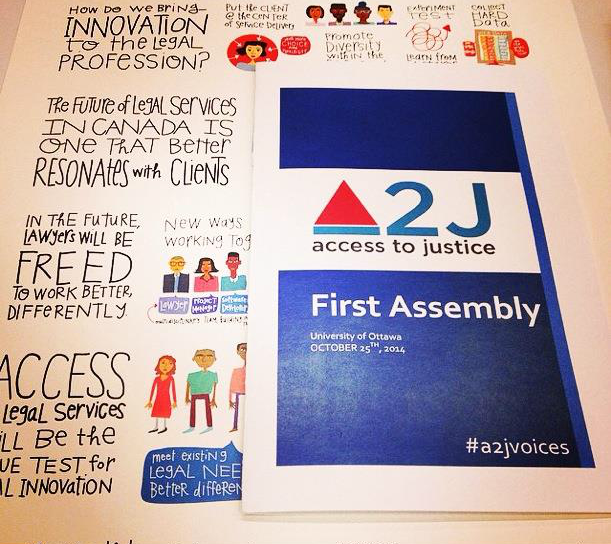 This assembly will be a chance for us to collaborate and strategize, building on our organizing campaign and conversations from the First A2J Assembly on October 2014 and the March 2015 Bencher Forum. When: October 24, 2015 from 9am – 5pm (lunch included), followed by drinks and dinner (location TBD). We will circulate a draft agenda shortly. Who: Are you an individual or organization who is interested in access to justice, specifically in addressing the rising cost of law school tuition and mounting barriers for new law students and lawyers? Then we want you to respond to this call! Come in yourself or have a representative from your organization attend the assembly. Why: We want to build an action strategy that will give students a strong voice in order to enhance the responsiveness and accountability of benchers, law schools, and the province. Our collective voice will be as loud as we make it – everyone is encouraged to participate in the discussions and share their ideas. public and media campaign work to build awareness about the unsustainability of massive debt financing of legal education and political action responses. Your support and continued organizing efforts are greatly appreciated. Please respond to gheir@hameedlaw.ca to express your interest in attending the assembly, joining our listserve or participating in our organizing efforts. If you are unable to attend in person but are interested in participating nonetheless, please let us know as we will canvass teleconference options in an effort to accommodate our out-of-town allies. Note: the event will be live streaming! Join us from anywhere in the world. Details to come. Welcome to A2J’s Second Assembly. Canvassing financial and structural problems facing students to becoming lawyers and practicing law. Discussion of LSUC’s lawyer licensing process, fees, and alternatives to the current regime to improve access to the profession. Lunch Break (12:45 – 1:30 p.m.) catered by Shawarma Palace. Creating an advocacy effort radiating through the administration of the Ontario legal system so it resonates with the province. Reflect on issues raised during the Assembly and identify further action and organizing steps. Please join us at The Draft Pub (801 King Edward Ave, Ottawa, ON K1N 6V1) for food and drink. 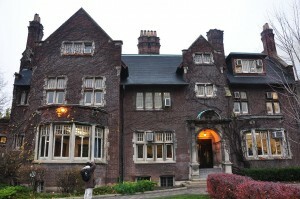 The Draft is an accessible venue. We hope to see you there! Previous post "It's dream crushing"